RALEIGH, N.C. (AP) — The only wild population of endangered red wolves is unsustainable and could be wiped out within years after dwindling to a few dozen, government officials said in a report Tuesday. The U.S. Fish and Wildlife Service review of the species’ status estimates that only about 40 wolves remain in the wild in eastern North Carolina, down from a peak of about 120 a decade ago. “The population cannot recover from their losses and overcome mortality resulting in a steadily declining population,” the review states, predicting these wild wolves could vanish in as little as a decade. Another 230 wolves live in zoos and wildlife facilities in what’s considered a more stable captive population. Conservationists contend the wild decline is due to neglect by federal officials who have halted releases of captive-born wolves and other efforts to bolster their numbers, such as sterilizing coyotes that compete for territory. Last month, conservation groups asked a federal judge to order those efforts to resume, saying it’s not too late to save the wild wolves. Leopoldo Miranda, an assistant regional director for the Fish and Wildlife Service, said the review draws on research showing the habitat won’t support the wild population without heavy human intervention. Miranda said the agency spends about $1 million each year on the wolves, more than any other endangered species in the Southeast. “The conditions conducive to self-sustainability are not present at this time in eastern North Carolina,” he said in a phone interview. Still, a chart released in a related federal report shows the leading causes of death for the wolves are man-made, with more than 80 dying from gunshot wounds over an approximately 25-year period ending in 2013. Vehicle collisions caused about 70 deaths during the period. The leading natural cause, health-related problems, accounted for nearly 60 deaths. The main purpose of the five-year review was to evaluate the wolves’ endangered species status, which it says should be maintained. It noted scientists have disagreed in recent decades about whether the red wolf represents a species unto itself, a subspecies or a more recent hybrid. The wildlife service said it will continue to recognize the species even as Congress has called for further study into its genetics. The review said government officials are continuing to develop their plan for the red wolves and would release more details later. The federal agency plans to take public comments this summer. Sierra Weaver, a lawyer for the Southern Environmental Law Center, disagreed with Miranda’s contention that the environmental conditions aren’t right for the wolves, noting they numbered 100 or more for a decade at the peak of the recovery effort. “The Fish and Wildlife Service is not taking the action that is required to recover the species, and indeed these documents indicate that they’re going to continue down that path,” she said in a phone interview. Weaver is one of the lawyers leading the lawsuit seeking to improve recovery efforts. Weaver argued in the March legal filing that the Fish and Wildlife Service shifted away from successful management strategies in the past five years because of pressure from a small but vocal group of landowners. Some landowners argue the wolves are nuisance animals that frequently wander onto their property. Ron Sutherland, a scientist with the Wildlands Network conservation group, said he’s disappointed that Tuesday’s review describes the wolf population as unsustainable without acknowledging detrimental steps by the government. “They stopped releasing new wolves from captivity, they stopped managing coyotes, and they’ve sat back and watched as gunshot mortality shredded the red wolf population,” he said in an email. Life on Earth used to look a lot more impressive. Just a little more than 100,000 years ago, there were sloths as long as a giraffe is tall, monstrous bears whose shoulders were six feet off the ground, and Bunyanesque beavers that weighed as much as an NFL linebacker. But over time, all of these creatures disappeared in a manner so rapid and so mysterious that scientists still can’t fully explain what went down. Did an asteroid discharge the mega-beasts, similar to the one thought to have snuffed out the dinosaurs? Or was it widespread climatic change or a plague of new diseases? Did our penchant for hunting play a role? It’s likely that a combination of factors led to a planet-wide demise in sizable mammals as the Ice Age came to a close. But a study published Thursday in the journal Science provides evidence that the major drivers were humans and other hominids. That is, until a new kind of predator arrived on the scene: Homo erectus. Around 1.8 million years ago, hominids that had long been dependent on plants became hominids that were “heavily and increasingly dependent on meat as a food source,” Smith said. As these tool-wielding team hunters spread out from Africa, large-mammal extinctions followed. If you’re going to spend time and energy on a hunt, these early humans and their ancestors probably believed, it’s go big or go home. It’s also possible that hominids actively targeted the mightiest creatures for other reasons — out of fear, perhaps, or perceived competition for prey. In modern times, human conflict with large animals is often about their taste for our livestock, as with wolves and lions, or their destruction or consumption of our crops, as with elephants and orangutans. As hominids dispersed, the average body mass of mammals in Eurasia dropped by about half over the course of 100,000 years, Smith and her colleagues found. In Australia, the average mammal body mass today is just one-tenth what it was before 125,000 years ago. North America was late to the game, as far as extinctions went, with most of its massive mammals surviving up to the very end of the Pleistocene. But when they did go, they went fast, a phenomenon Smith says might have to do with the invention of more-effective, long-range hunting weapons by Homo sapiensand the disappearance of all rival hominids. All told, after the dust of extinction had settled, the size of North America’s average mammal dropped from 216 pounds to about 17 pounds — the size of a bobcat. To see what might happen if this shrinking trend continues, Smith presumed that all animals now listed as endangered or threatened would eventually go extinct and then removed them from the data. Blue whales? Gone. Elephants? Poached out of existence. Polar bears? Glug, glug, glug. Go down the line, and within a few hundred years you wind up with a planet where the most substantial mammal is none other than the domestic cow. Ripple, the ecologist, is unsurprised. He has published numerous papersfinding that large mammals are at a disproportionate risk for extinction. “I think this paper is a significant contribution to what I call the ‘downsizing of nature,’ ” he said of the new study. Of course, several animals make a living by preying on larger creatures, Ripple said. Gray wolves can take down an elk; killer whales have been seen dispatching gray whales. While the new paper focuses on mammals, Ripple said the same size-selective pressures are bearing down on the world’s grandest fish, reptiles, amphibians and birds. And we’re only now starting to understand what consequences this might have for the ecosystems all around us. Smaller animals will hoof it straight up a hill, creating a vertical game trail, Smith said. Bulkier animals must curve their way up an incline, making switchbacks and long, meandering depressions. The difference in these paths can affect erosion, water dispersal and the distribution of vegetation. “So even something as simple as how they walk through the environment can change everything,” Smith said of big animals. Cows’ ecosystem services, she notes, are no match for those of elephants. Evidence that hominids have been dooming large species for nearly 2 million years could be read as an excuse for modern humans and all the animals we’ve pushed onto the Endangered Species List. But Smith said there’s a difference between then and now. “Now we’re at a point where we can be aware of it,” she said. And we have a choice: Are we going to keep killing them off for food, clothing and talismans, or are we going to break with hominid tradition and find ways to coexist with the behemoths that remain? Waterfowl species to brink of extinction? Crossing national and international boundaries, millions of migratory birds descend on India to avoid the extreme winter chill in their native habitats. Many of them never return to their breeding grounds, say ornithologists. The reason: They are exposed, largely in non-protected wetlands, to illegal killing and trade. Scientists, mainly from Mysuru’s Nature Conservation Foundation, during their fieldwork in 27 wetlands in Tamil Nadu’s Kanchipuram district, estimate that at least 1,700 waterbirds, mainly large- and medium-sized, are hunted every year in each wetland. They say hunting is widespread from December to April, the peak season of winter migrants. “This translates to hundreds of thousands of waterbirds being killed every year across India in non-protected wetlands. Such a high scale of hunting was unknown previously, and is not sustainable,” Ramesh Ramachandran, a Research Associate with the Cranes and Wetlands Programme of the Nature Conservation Foundation, told IANS. In Tamil Nadu alone, the winter migrants include the ruff—a medium-sized wading bird that breeds in marshes—common sandpiper, great cormorant, common teal, red-crested pochard and the common pochard. “All of these migratory species are falling prey to poaching,” he said. Policeman-turned-conservationist Ramachandran is the lead author of the research paper titled “Hunting or Habitat? Drivers of Water Bird Abundance and Community Structure in Agricultural Wetlands of Southern India” published in the journal Ambio this year. “Out of the 53 species recorded in different wetlands during the study, we found 47 species with local hunters,” he said. The hunted birds are largely sold to local food outlets. Co-author K.S. Gopi Sundar, also with the Nature Conservation Foundation, said illegal hunting practically affects all of the bird species in the wetlands. As a signatory to the Ramsar Convention, the inter-governmental treaty that provides the framework for the conservation of wetlands and their resources, India’s responsibilities include providing protection to all migratory waterfowls. Most of the migratory species use the Central Asian Flyway, and India is a signatory to the international agreement to conserve migratory birds of prey. “Several of the migratory species using the Tamil Nadu wetlands are known to breed in Russia, though the intention of the study was not to confirm the breeding grounds of the birds that poachers were hunting in Tamil Nadu,” said Sundar, who heads the Cranes and Wetlands Programme. He told IANS that the study was not able to confirm if there was more hunting in the wetlands around protected areas compared to the wetlands away from these areas. “There is a need to revise our current policies and action to conserve the waterbirds. Several mammals like leopards and hyenas and most waterbird species are not confined to protected wetland reserves or in wetlands that occur inside forest reserves,” Sundar said. The vast majority of wetlands in India occur outside protected areas and so the majority of waterbirds are not protected by strict protocols followed within the protected areas. “We need to think much more comprehensively about waterbird conservation. Plans should include and involve stakeholders such as panchayats, farmers and other such people in whose lands waterbirds are found,” Sundar said. Surprisingly, the movement patterns of most of the birds in India are yet unrecorded. “The policy will require to be general at this point in time to ensure that we safeguard our waterbirds,” Sundar added. Sundar and his team also recorded illegal bird poaching in Uttar Pradesh, Maharashtra and Rajasthan. “We recorded hunting in 100 per cent of the wetlands during a recent survey we carried out in southwestern Uttar Pradesh. The scale of hunting was not as large as is in Tamil Nadu,” he said. In another study on unprotected agricultural wetlands in Maharashtra, the team uncovered illegal hunting in over 60 per cent of the wetlands. “I have also witnessed hunting in several wetlands of southern Rajasthan and around Bengaluru. The hunting is very widespread in the unprotected wetlands of the country and that it is likely the single-most important threat to waterfowl in the country today,” Sundar said. Around 70 per cent of 272 hunters that Ramachandran and his team interviewed in Tamil Nadu reported a decline in bird species, especially large-sized, in the past decade. The noticeable declining species are the bar-headed goose, Eurasian spoonbill, glossy ibis, painted stork, Indian black ibis and the spot-billed pelican. The study says hunting remains one of the least studied aspects of bio-diversity conservation in India. Contrary to assumptions, hunting is driven by market demand and not subsistence. “We estimated an average monthly income of Rs 12,524 ($196) per hunter earned through hunting,” says the study. The pond heron was observed to be the most commonly traded bird species. The other large waterbirds included the black-headed ibis, Asian openbill, Eurasian spoonbill, glossy ibis, great egret, painted stork and the spot-billed pelican. You and I know that the birds weren’t a precursor of mankind’s demise—but in a way, there was impending doom ahead. These birds were Carolina parakeets, America’s only native parrot. Exactly 100 years ago this February, the last captive Carolina parakeet died, alone in a cage in the Cincinnati Zoo, the same zoo where the last captive passenger pigeon, named Martha, died four years earlier. The last “official” wild Carolina parakeet was spotted in Florida just two years later. 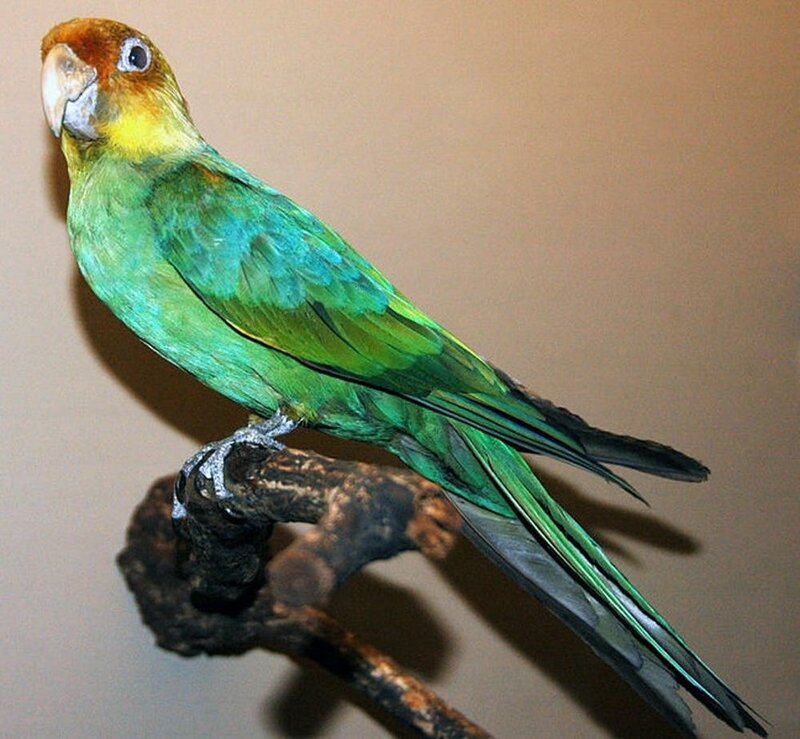 The extinct Carolina parakeet, mounted on display at the Field Museum of Natural History in Chicago.Wikimedia Commons, CC BYI spent hours upon hours reading historical documents, travel diaries and other writings, ranging from the 16th century all the way into the 1940s. I’ve often become lost in the stories surrounding these parrot observations—from the first accounts of Europeans exploring the New World, to the harrowing tales of settlers traveling the Oregon Trail in the 1800s, to grizzled egg hunters scouring the swamps of Florida in the early 1900s. My goal was to unravel some of the lasting mysteries about the Carolina parakeet—like where it lived. Historically, people used to determine a species range by plotting the most extreme observations of that species on a map, drawing a polygon around them and called it a day. Because of this, people long thought Carolina parakeets lived from upstate New York all the way to Colorado and down to the Texas coast. But birds are often seen in areas where they don’t normally go. For instance, the range of the snowy owl—like Hedwig of “Harry Potter” fame—doesn’t really extend all the way to Bermuda, though one was once spotted there. 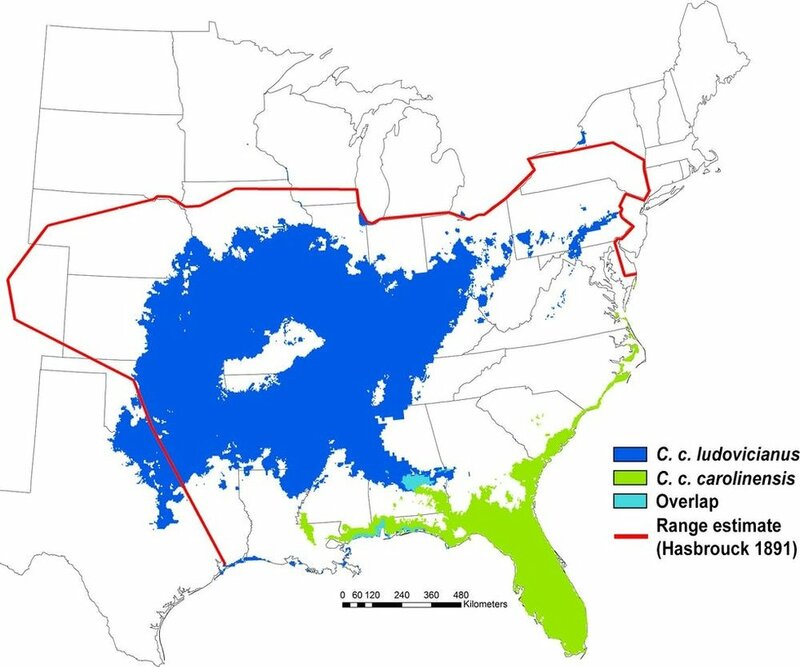 The historic distribution of the extinct Carolina parakeet. The green area represents new understanding of where the eastern subspecies lived. The blue is where the western subspecies lived. The red line is based on a range map for the species published in 1891.Ecology and Evolution (2017), CC BYWhat’s more, scientists don’t know what really drove these parakeets to extinction. Some thought it was habitat loss. Some thought it was hunting and trapping. Some thought disease. A few even thought it was competition with nonnative honey bees for tree cavities, where the parakeets would roost and nest. by Courtney Flatt Follow NWPB/EarthFix March 21, 2018 6 p.m. | Updated: March 22, 2018 6:30 a.m. Interior Secretary Ryan Zinke is heading to the North Cascades Friday to speak on reintroducing grizzly bears in that part of Washington. His agency had previously suspended controversial efforts to bolster the bears in the area. Scientists think there are fewer than 10 grizzly bears left in Washington’s North Cascades. The federal government looked at options to help the population. They’ve ranged from a do-nothing approach to reintroducing grizzlies to the area. The plans proved controversial. After public meetings across Washington, the government was in the midst of reviewing nearly 127,000 public comments. Grizzly bear numbers have been drastically reduced in Washington from over-hunting and habitat loss. Biologists say the bears could become extinct in the North Cascades if nothing is done. U.S. Interior Secretary Ryan Zinke, in a surprise to conservationists, announced on Friday in Sedro-Woolley that he supports the restoration of grizzly bears to the North Cascades ecosystem of Washington. “I’m as astounded as anyone but he’s not said a single word I don’t agree with,” Mitch Friedman, longtime leader of Conservation Northwest, messaged a friend. Idaho officials have started the process of opening a grizzly bear hunting season this fall that would allow the killing of one male grizzly. The Fish and Game Commission in a 7-0 vote March 22 directed the Department of Fish and Game to gather public comments on the possible hunt. “There would be a lot of interest in the possibility of a grizzly season,” Commissioner Derick Attebury said after the meeting. Attebury represents the portion of eastern Idaho where the hunt would occur. © TONY KARUMBA/AFP/AFP/Getty Images A caregiver calms Sudan — the last known male of the northern white rhinoceros subspecies — in 2016 at the Ol Pejeta conservancy in Laikipia County, at the foot of Mount Kenya. Correction: This story has been updated to clarify that Sudan was a northern white rhino. A grizzly bear roams near Beaver Lake in 2011 in Yellowstone National Park. A proposal introduced in the Wyoming Legislature seeks to impose a wildlife conservation fee at Yellowstone. A federal district judge derailed a docket full of legal preliminaries about removing the grizzly bear from Endangered Species Act protection on Tuesday, in hopes of getting the whole matter decided before Wyoming and Idaho open grizzly hunting seasons this fall. In a ruling from the bench, Christensen denied the federal government’s request to delay proceedings in six lawsuits challenging the delisting of grizzly bears in the Greater Yellowstone Ecosystem. He also rejected requests by three different groups to decide the case based on technicalities. And he ordered all parties to put their sprawling arguments into a single set of briefs for a hearing in August. Tuesday’s hearing brought together federal lawyers representing the U.S. Fish and Wildlife Service against the Northern Cheyenne Tribe, Sierra Club, Center for Biological Diversity, National Parks Conservation Association, Humane Society of the U.S., Wild Earth Guardians and an independent attorney from Chicago. On the sidelines, lawyers from Safari Club International, the National Rifle Association and the Rocky Mountain Elk Foundation also sought intervener status in the case. FWS delisted the roughly 700 grizzlies in and around Yellowstone National Park on July 31, 2017, while leaving protections in place in five other grizzly recovery zones. The next day, a Washington, D.C. appeals court overturned the delisting of gray wolves in the Western Great Lakes Region. That case warned FWS that it couldn’t remove Endangered Species Act protections from one distinct population segment without showing how the decision would affect other protected wolf populations. Four months later, FWS officials published a request in the Federal Register asking for public comment on whether the Great Lakes wolf decision might affect Greater Yellowstone grizzly delisting. Christensen found that confounding. Howell replied that FWS needed until at least April 30 to analyze the comments and then either add more findings to the existing delisting rule or start the process of withdrawing it. Doing so would ensure the court had a fully prepared agency rule to consider, he said. “Meanwhile, Wyoming will be turning 24 grizzly bears into rugs and wall hangings,” O’Brien said. Wyoming’s Game and Fish Department has proposed allowing hunters to kill up to 24 grizzlies starting in some areas on Sept. 1. Idaho’s Department of Fish and Wildlife has proposed a fall hunting season for one bear. Montana Department of Fish, Wildlife & Parks officials decided not to hold a 2018 grizzly hunt. Additionally, the grizzly management rules in Montana, Idaho and Wyoming allow much more leeway for farmers and ranchers to kill grizzlies threatening their livestock than the ESA permitted. That means grizzlies and their advocates could suffer harm every day that the court delays a final decision on whether to put the bears back under ESA protection. 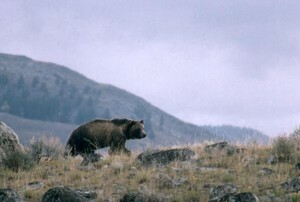 Christensen said he was not pre-judging the case when pointing out that both sides acknowledged the reduced protections grizzlies had under state management. Given that and the lack of justification for the FWS public comment review, he denied the government’s request for a delay. But then he went further. “There’s only one of me and an army of you,” Christensen said to the roomful of attorneys. Pushing the deadlines closer to a potential hunting season would invite last-minute requests for restraining orders and injunctions.